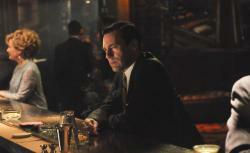 Don’s toothache: The broadest metaphor in Mad Men history. Well, that was underwhelming. This isn’t the first time a season of Mad Men has felt like it climaxed in the penultimate episode, only to peter out in the final hour. Perhaps it was the desire on the part of the writers to check in on an unusually broad cross-section of characters, but the finale felt a bit diffuse to me. One question overhanging the episode was whether and when to wallow in doom and gloom. Haunted by Lane’s death, Don starts seeing the apparition of his dead brother Adam, replete with a nasty ligature mark. Incapacitated by a horrendous toothache—a strong contender for the broadest metaphor in Mad Men history—Don refuses, at first, to have the malignant thing inside him excised. He clearly feels guilt over Lane’s death, yet is oddly stingy with the death benefit—paying Lane’s widow precisely the $50,000 that Lane put into the company, and not a penny more. In light of Lane’s passing, I had more irritation than sympathy for Megan’s continuing struggle to make it as an actress. One thing I’ve had trouble gauging is whether Megan actually has any talent. Her mother suggests, pretty directly, that she doesn’t. “Not every little girl gets to do what they want,” she says. “The world could not support that many ballerinas.” And Megan herself raises the possibility that she may simply not have the chops. Yet Megan gets the audition and lands the part. Are we to read that as a job she secured purely through the good offices of her husband? “You want to be somebody’s discovery, not somebody’s wife,” Don says. But in the end, which is it? When Don stares at Megan’s screen test, his cigarette smoke curling through the projection light, and changes his mind about helping her, is he doing so because he somehow deduces her natural talent through that short and awkward reel, or because he sees this woman that he loves and decides that he wants to help her, irrespective of her talent, Marie’s advice be damned? More importantly, how do we read Don’s final encounter at the bar, as Megan prepares for her close-up? He orders an Old-Fashioned and pulls out a cigarette, and there’s the strong suggestion, as the music picks up, that we should tune in next season, because the hound dog is back. That’s an enjoyable prospect, I won’t lie, but I hope one of you can explicate for me how, if at all, it relates to Megan’s landing the part in Beauty and the Beast in Butler Shoes. I was similarly mystified by the reappearance of Beth Dawes, and the explanation that she is an electroshock patient who wants one last night with Pete before her brain is erased. One of the delights of Mad Men is the crackling sexual chemistry between its men and its women. (Witness the Drapers’ new crank caller: “Marie, it’s Roger Sterling. I’ve used up all the French I know.”) But Pete and Beth feel painfully inert, and I don’t really buy that the two of them share some unique bond of undiagnosed clinical depression. I loved the fresh Life Savers excuse (they really are different from the vending machine), and I suppose Pete’s little speech about learning, through this dalliance, that his home life is just a “temporary bandage on a permanent wound” is interesting enough. But so it is with all the married male characters on Mad Men. As Stan would say, I’m bored of this dynamic. I’ll leave it to you two to explore the sudden fortunes of the firm, which in the space of a single quarter has gone from financial crisis to the promise of a duplex office space next season. And to riff on Peggy’s encounter with Don, when they both select the same matinee in which to knock out the cobwebs. I was pleased to see Roger tripping again, if a little nervous about his open window; I was completely befuddled by the puppy love outside Peggy’s. This is a short week for me, and I have postcards to write. So I’m signing off here. John and Julia, it was a thrill to join you two for the TV Club. A huge thanks to both of you, and to our readers and commenters.